This bag was previously introduced during the Paris in Rome 2016 Collection (Pre-fall 2016 Collection) and since then, everyone is raving about this multi-purpose drawstring bag. Ladies, keep your eyes glued on the Chanel Trendy CC Drawstring Bag. Made from genuine lambskin & light gold metal, the Chanel Trendy CC Drawstring Bag is a perfect match for women who are looking for a sizable bag without losing its trendy appeal. Channeling the ever classy and sophisticated feel of the brand, this drawstring bag features the thick diamond quilting effect we used to love and up until now still gush about. It also has an interwoven chained shoulder strap, with a Chanel plate placed at the uppermost part for recognition. This is truly the drawstring bag at its best, you won’t find something chic’er than this. And all the merits should also go to the golden plate with ChANEL’s logo graved on it. The Trendy CC Drawstring Bag? Yes please! Style code: A93494, measuring 11.8′ x 10.6′ x 5.11′ inches, priced at $3900 USD, €3800 euro, £3020 GBP, $6060 SGD, $31900 HKD, $6060 AUD and is available via Chanel boutiques. Here we are in October and it really doesn’t feel like it. I have been dreading the arrival of fall weather because I know that means, winter is coming. However with the abnormally warm weather we have been experiencing, it seems as though summer still wants to hang on. It’s confusing and it makes my brain switch gears back toward warmer season things. I guess that means I can open my mind up to the Loewe Flamenco Knot Petal Slouchy Bag. The Loewe Flamenco Petal Bag definitely looks out of place in the fall season lineup, but I just couldn’t help myself. I always love a good drawstring bag, especially when it happens to be unique. This piece is unique via a springtime theme. The top edge is bordered with multicolored petals that come together to form a flower when the drawstring closure is pulled closed. A cutesy flower, but a flower nonetheless. The navy color is sort of fall-ish, but the white and light blue petals aren’t so much. It is an interesting take on the classic Flamenco design though, even if it feels a bit out of place at the moment. This seems like a rather casual style and I can’t help but picture it with blue jeans. Loewe has been the authority in leather goods for over 160 years, and with Jonathan Anderson as Creative Director, the Spanish house continues to design classic handbags using cutting-edge techniques. As promised, here’s a quick update on the prices and sizes of Chanel’s new bag that will be launched in Singapore come June 2016. First revealed right here on the blog last month, the Drawstring Bag collection will come in 2 different leathers and in 2 sizes. Yes, as mind-boggling as it might sound, it’s pretty straight-forward, so here goes. On the left, you’ll see the one in calfskin leather, and on the right, the one in nubuck, which is different from suede. Whilst suede is from the underside of the skin, nubuck is from the outer side, where it has been rubbed down to give it the same feel of suede. Now for the two sizes. As you can also clearly tell from the image above, one’s larger than the other (duh) and their sizes are as follows: the larger one is 33.5 cm by 30 cm by 19 cm, while the smaller one comes in at 29.5 cm by 26 cm by 13 cm. Now for the part that’s a tad confusing. Because the bags come in 2 sizes and 2 different leathers, there are 4 prices in all, so I’ll do it by size/leather/price for each style. If it is the smaller nubuck bag you’re after, it’s SGD6220. The smaller one in calfskin?SGD6690. Then we have the larger bag in nubuck that will set you back by SGD6860, while the larger one in calfskin leather is priced at SGD7340. 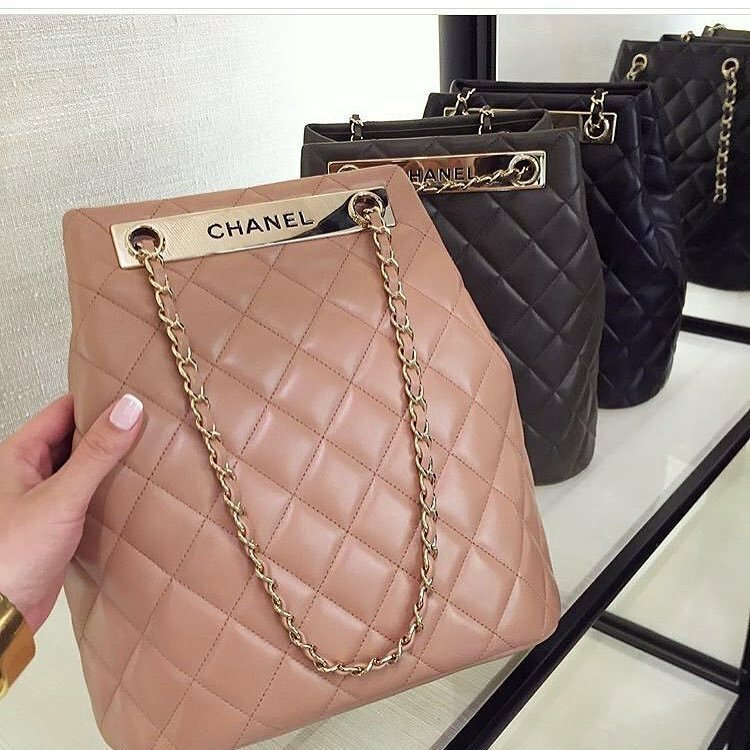 Available in Black and Khaki for the ones in calfskin and Brown for the nubuck, do note once again that the bags will only be released in June, so wait list now at Chanel boutiques in Singapore if you must. As for the price/size of the 2.55 in calfskin leather that’s also new, let’s just wait a couple more days before I do that post, ok? Conquer the streets of Manhattan, Los Angeles, Paris, Milan, Tokyo, Seoul, and all the other major thriving cities in the world with this ultra chic and trendy drawstring bag from fashion powerhouse Louis Vuitton. Impress the crowd as you walk and strut your fashionable stuff as if you’re one of those glamorous high maintenance models in a star-studded fashion week runway. Be the center of attention with your trendsetting outfit coupled and complemented by this LV drawstring bag. What makes it perfect is the fact that you can use this bag wherever and whenever. Go to the office with this gem of a bag and they will see you as a cute school girl turned office girl who knows how to be fashionable in the corporate world. Better yet, why not use it as you travel abroad and as you hop in and out of trains? People will definitely love your designer drawstring bag. Wanted to go to the gym but doesn’t have enough time to go home and change? Stop getting stressed for this LV bag can work as your gym bag as well. What more can you ask for? With Chanel, you’ve got to expect the unexpected…sometimes, they border on outrageous, but you know, it’s the designs that count! Today, we’ve got something different for all of you. We know that a lot of us here are ‘Flap Bag Girls’ or ‘Boy Bag Diehards’ but hey, let’s take a breather first as we give you the Quilted Drawstring with Flap Bag. It’s another fab piece that you should watch out for! This piece looks like a cross between a usual drawstring and the classic Flap, but forget leaving room for squares or rectangles – it’s a bucket, really. Remember the Bolide Double Bottom and the hype it created? Well, the concept’s kinda visible these days. The design is charming and appealing for those who’d want something new, but there are some basic babes here on our community whom we would like to hear from. What’s your take on this piece? Is this swoon-worthy, or just over-the-top for you? Stay tuned for more updates about this bag (and other pieces) very soon!